Around since 1997, the Subaru Forester is a vehicle that has always blurred the line between a crossover and a wagon by taking each bodystyle's main attributes. Couple that with a standard all-wheel drive system, and it's little wonder why the Forester is among the better choices in the compact SUV market. The 2018 model appears towards the end of the nameplate's fourth production cycle, with very few major changes made. The 2018 Subaru Forester is split into six trims, with the 2.5i Limited functioning as its mid-tier model. Designed as a five-seater compact crossover SUV, the latest iteration of the 2.5i Limited provides 103.3 cubic feet of passenger volume, in addition to leather-trimmed upholstery. Behind the rear seats is 31.5 cubic feet of cargo volume, although you can fold down the seats to expand luggage space to 68.5 cubic feet. Front seating accommodation includes a 10-way power-adjustable driver's seat, with heating capability on both sides. Providing the infotainment is the Starlink Multimedia Plus system, which includes features such as six-speaker stereo, an AM/FM radio tuner, HD Radio, a single-disc CD player, a four-month complimentary subscription to SiriusXM satellite radio, Bluetooth for audio streaming and hands-free communications, Siri Eyes Free for voice-activated technology with your iOS device, and a 7-inch high-resolution LCD touchscreen display. Additional standard comfort and convenience features on the crossover include steering wheel-mounted controls, a panoramic power moonroof, and a 4.3-inch color multi-function display. You have the option of upgrading your infotainment with a voice-activated GPS navigation system. The 2018 Subaru Forester 2.5i Limited rides on 17-inch black machined-finish aluminum-alloy wheels with all-season tires. At the front, the Forester has multi-reflector halogen headlights, which automatically turn on or off depending on the amount of light there is outside. Below them are a pair of fog lights for more penetrating illumination when needed. Flanking the front doors are body-color side mirrors. And at the roof, the panoramic power moonroof is joined by raised black-finish roof rails for added cargo carrying capacity. At the back is a rear spoiler for enhancing aerodynamic performance and the Forester's sporty look. The four-wheel independent suspension on the 2018 Subaru Forester 2.5i Limited consists of a strut-type design with a lower L-arm and stabilizer bar at the front; and a double wishbone design with a stabilizer bar at the back. Due to its design, the suspension is able to shield the cabin from any turbulence resulting from driving on less-than-smooth surfaces. The 2.5i Limited uses electric power-assisted rack-and-pinion steering, which provides crisp and precise cornering. Powering the 2.5i Limited is the 2.5-liter 4-cylinder horizontally opposed Subaru Boxer engine (thus the "2.5i" designation). The Boxer engine produces 170 horsepower and 174 lb-ft of torque, and it is linked to the Lineartronic CVT, which is what Subaru calls its continually variable transmission. By seamlessly changing through effective gear ratios-rather than relying on the traditional gear-shifting method-the CVT enables the 2.5i Limited to drive smoothly and perform better in terms of fuel efficiency. With its powertrain configuration, the compact SUV can tow up to 1,500 lbs. 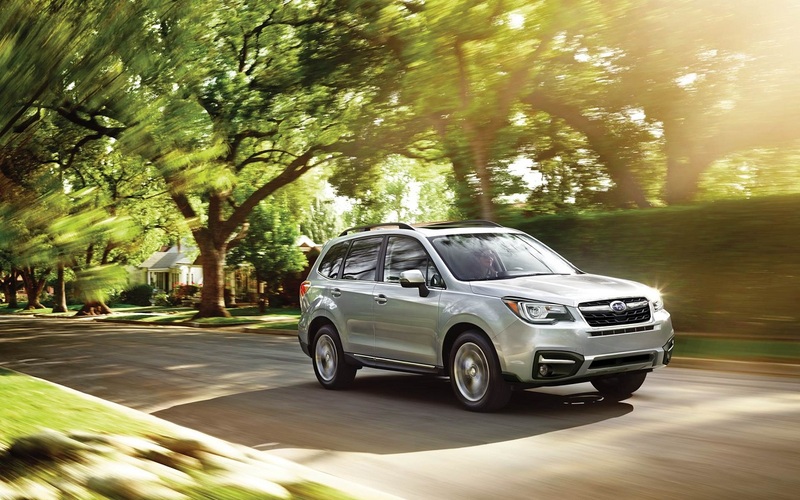 The airbag system on the 2018 Forester 2.5i Limited consists of dual front impact airbags, a driver's knee airbag, a pair of side impact airbags, and roof-mounted side curtains covering both rows. There's also the aforementioned Starlink multimedia system, which provides services such as automatic collision notification, roadside and emergency assistance, and vehicle recovery. For optimal braking ability, all wheels have disc brakes with ABS for preventing wheel lock-up, brake assist for extra stopping force when needed, and brake override to prevent unintentional acceleration. Unique to the Forester is X-MODE, which maximizes engine output and transmission ratio, increases engagement of the all-wheel-drive system, and uses enhanced control of the electronic stability control system to reduce individual wheelspin and consequently provide optimal traction on low-friction surfaces. Also present are the aforementioned electronic stability control for keeping you on your intended driving path, hill descent control for safe driving down a hill, a rear vision camera to flash a monitoring video image when moving the vehicle in reverse, and a traction control system to combat skidding on slippery surfaces. Advanced safety features on the 2.5i Limited consist of blind spot detection with rear cross-traffic alert; and the EyeSight suite of driver assist technology, which comprises adaptive cruise control, pre-collision braking, lane departure, sway warning, and lane keep assist. Security on the Forester 2.5i Limited is provided by an anti-theft system that combines remote keyless entry with engine immobilization.